Driving north into Telsin visitors cross Nisutlin Bay on the Alaska Highway's longest bridge. To the east of the bridge lies Nisutlin Bay Delta National Wildlife Refuge. This important protected area is a higly-flavoured destination for birders and naturalists. 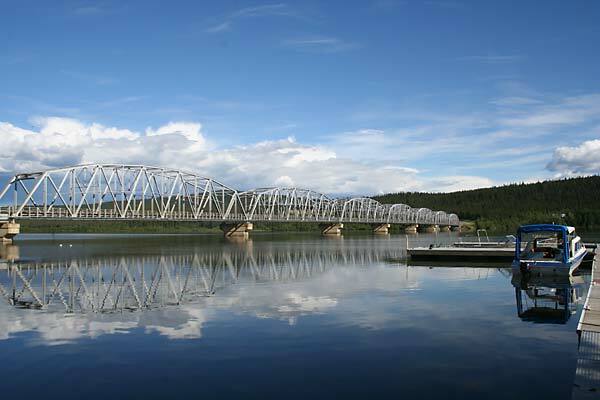 To the west, two long inviting arms of Teslin Lake stretch out, ready for exploration by boat or float plane. Teslin Lake was one of the water routes to the Klondike during the 1898 gold rush. Paddlewheel steamers plied the lake and Yukon River, transporting goods between Whitehorse and Teslin, until the highway was built in 1942. Today, you can rent canoes or hire guides to take you fishing or birding at the Nisutlin Delta National Wildlife Refuge. Site by PR Services Ltd.